There are still many things I have yet to discover about Japan or Japanese or something Japanish or Japaneseish, you get the picture. Through my extensive research so far of everything Japan, I am becoming and expert of course, I have found something called Death Note. Death Note is an anime series about exactly what it says in the name, a note about death. More to the point however it’s a notebook that is used to write someones name in to have them die. Quite something if you ask me. Could you imagine a notebook written for the soul purpose of the systematic destruction of a people(s) of your choosing? Come to think of it, it’s happened already many time throughout our history. Probably the most recent and notable is Mein Kampf authored by Hitler outlining his political agenda and plans for the new world Germany. With that there was also a book at the time called Sonderfahndungsliste G.B or better known as The Black Book which was a list of 2,820 Britons to be arrested by Nazi Germany of her successful invasion of England by 1940. So I guess an anime series about something similar isn’t too far off. 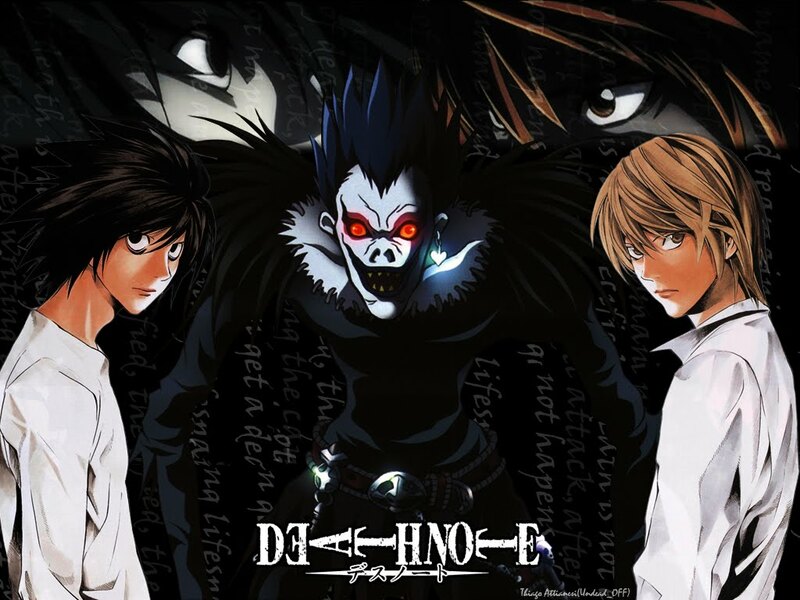 The Death Note series is composed of 37 roughly 20 minute blurbs taking you through a dramatic process of conflict and resolution around the notebook. The series starts with a shinigami or death god that drops the notebook from the “underworld”. Death gods are supernatural gods in Japanese culture who invite humans to their death. In the case of the Death Note series, a shinigami writes down a humans name they choose to die. The notebook is dropped by the god because he’s basically bored with the underworld and wants to give the power of the notebook to a human for his own personal “entertainment”. The notebook is picked up by Light Yagami who is a highly intelligent young high school student who believes the god picked him for the purpose to use the book. He immediately is enamored with the power of the notebook and wants to become his own god of a “new world” to rid the planet of anyone he’s see’s fit to die. Yeah, you can see where this is going already. Light is challenged by L, who is rivaled by Light’s intelligence and youth, to find who the user of the book is and bring him to justice. The notebook also has a set of particular rules to follow when using it. It’s quite an extensive list to describe but basically if you don’t follow the rules properly, bad things can happen to the user or otherwise. The majority of the episodes center around the struggle between Light and L trying to outdo each other. L does not know Light holds the power of the notebook but is always suspecting him. They eventually wind up working with each other to find out who is using the book for the killings. The Japanese police force along with the cooperation of the CIA and FBI are also in search of the person who holds the power. At the end of the story, yeah right. Watch it for yourself! Through the plots twists and turns and dramatic circumstances it’s hard not to want to watch the entire series all at once. I had actually gone through it entirely about a year ago and refreshed my memory with another viewing of the series over 3 days recently. There were also a movie series done on the story line which is quite interesting. If you like CSI or other related types of dramatic police investigation types of stories this one is for you. And, it’s anime.